La primera línea de playa Villa, Casa Alegre es un compuesto de verdadero lujo diseñado para el viajero de élite acostumbrado a sólo estaba de vacaciones en los mundos mejores lugares. El histórico pueblo de Loreto ha sido nombrado uno de los pocos México 'Pueblo Mágico'. Una designación que identifica sólo que es más digno, raro, histórico y bonitos pueblos. Villa Alegre es el mejor absoluto Casa disponible en el centro de Baja Sur. Casas similares en otros lugares se ofrecen a miles por día. Villa Alegre es realmente un gran valor. Haga de sus vacaciones planea pronto. Villa Alegre seguramente se convertirá en un billete codiciado. La villa frente a la playa está equipada con cinco habitaciones individuales con baño privado. Cuenta con una proyección de estilo de sala de cine de Hollywood, con una gran selección de vídeo de películas clásicas y contemporáneas, carteles de cine de época y cortinas de terciopelo. Por encima del teatro donde encontrará una zona de juegos al aire libre cubierto. Explorar la "magia" de este histórico de Puebla. Explorar la Ciudad de Loreto para la pesca, excursiones y aventuras de la isla que están disponibles. Tenemos un Jeep 4 pasajeros a disposición de los huéspedes que comprar un seguro de responsabilidad civil mexicana antes de llegar. También tenemos un tándem Kayak disponible. Es necesario asegurar ambos elementos y que cobrará la fianza si está dañado o perdido. Truly a great house for couples or families! A nice casual feel and ambiance. Large kitchen with plenty of amenities. We hired a chef for breakfast (Lucy) she was amazing! Really made the trip for the adults! She did a Mexican dinner for us on last night abd food was delicious!! Oscar (taxi #32) was there for all our needs! Local farm tour and San Javier Mission) plus local trips! Awesome! Carlos the caretaker was always there to help with anything! All Very very safe! Location is supreb. Easy 15 min walk into the historical square! Mi Loreto was great food! Islas was great too Food is better in Loreto and 1/2 the cost of Cabo or PV. Loreto is a must do for fishing/laid back/no party scene/good service/Coronado island was amazing day trip!! ( felt like I was in Tahiti) A must!! We had two families share this property for eight days and it could not have been better. (Ok, the weather could have been a little better the first two days....) The pictures and description do not do the property justice. 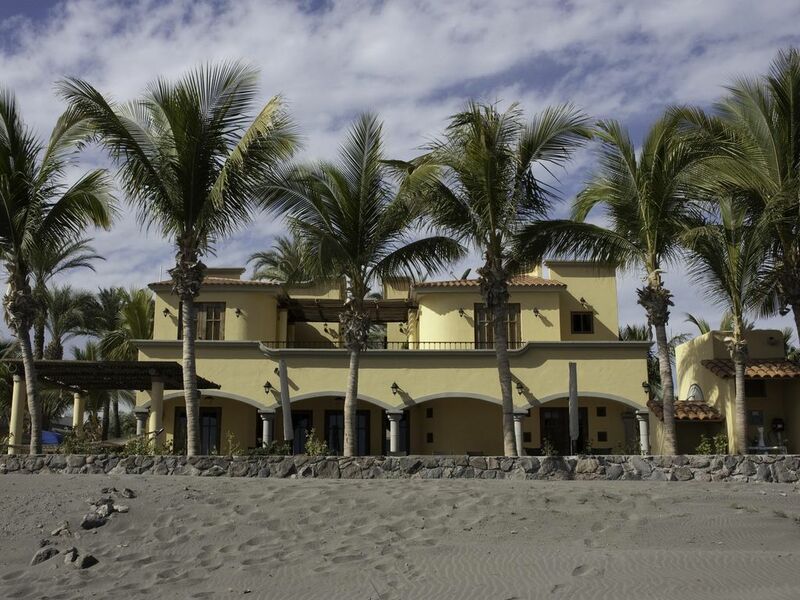 First, we walked all over Loreto and never saw a beachfront property with better privacy. The house has open lots on either side that are part of the property, not only providing privacy but the view aperture is incredible. The beach is literally right up to the pool deck, with a sandy, shallow calm access to swimming and kayaking. The house itself was perfect for us, with multiple bedrooms having large, en-suite bathrooms. We ate in multiple nights, using the outdoor kitchen to barbeque and there is plenty of seating inside and out. The layout gives it a unique feel, with the upstairs bedrooms accessed by exterior stair, opening to an expansive outdoor terrace. The pool is nice and includes a large hot tub that was well used. We could not be happier with the house and property. Jeanne was great as well, meeting us at the house for orientation and helping us out with details. Carlos, the caretaker, is a true gem and lives in a sweet little house inside the gated compound and was there for us when needed. We literally were able to just go knock on his door when something was needed. We walked to town every day, sometimes multiple times. The access is easy, by road through the arroyo, or at low tide by beach, with a short wade. Loreto is lovely, not too touristy but with enough tourist accommodations to make it easy for those of us who don't speak Spanish. We caught some fish, snorkeled, sat on the white sand beaches of Isla Coronodo and enjoyed a weeklong break from the Pacific Northwest winter. It was a fantastic experience overall and I highly recommend Loreto and this property in particular. So glad to hear you enjoyed it, hope to see you back again! Casa Alegre was a wonderful place for us to celebrate Christmas with our 2 adult kids, their spouses, and the 4 grandchildren. There was plenty of room for us to spread out, the kitchen was well equipped, and the sunrises were fantastic. The tree frog bedroom was fun and the master suite beautiful. The kiddos would have spent the entire day playing in the pool/hot tub, but we also enjoyed going out on the 2 kayaks from the house and the SUPs we brought with us. Beachcombing netted lots of great shells and we harvested clams for dinner several nights. We loved being away from the busy part of the harbor, yet being able to walk to town for shopping or ice cream almost every day. Carlos (the caretaker) quickly responded to any needs we had and Jeanne was very helpful in our planning efforts. We were grateful for use of the Jeep for grocery store runs, but highly recommend Oscar, Taxi #32, for any other transportation needs. We hired him to take our group of 10 to the St. Javier mission one day, which included stops at several points of interest and included lunch at his in-law's farm where the kids got to help make tortillas that were cooked over a wood stove. He also helped us arrange for a local chef to cook an authentic Lorentano dinner at the house one night. If you're going to Loreto with a large group, this is THE place to stay! We hope to return in the future. Best time ever on the Baja for all of us! Our group of 10 friends and family members just returned from a 2-week stay at Casa Alegre. Best time ever! The house with all its amenities -- pool, spa, home theatre, gourmet kitchens indoor and out, ping pong, ice machine! -- cannot be beat! And in the most beautiful beachfront setting you can imagine, it was like a paradise dream vacation come true. All with one of the most spectacular views of the Sea of Cortez you'll ever see. Oh the sunrises! This trip was a first time to Loreto for all of us after having been to Baja several times before further south. Really enjoyed the historic small town charm and friendly vibe. Big thumbs up to Mi Loreto for their delicious local cuisine we very much enjoyed. The mole is sooo good! And kudos to Doobie and his brothers for guiding us on several days of fishing, snorkeling and island sightseeing. Five yellowtail in the boat! "No chicken dinner tonight!" Of course we couldn't have done all this and had so much fun without lots of help. Thank you Jeanne and Carlos for taking care of us and making our stay so comfortable and trouble-free. You're awesome! And thank you Delpit family for sharing your beautiful Casa Alegre with us. We love it and hope to be back! Awesome stay Jeannie and Carlos were excellent. Explorar las 5 islas de la costa en el Mar de Cortés, en coche a la montaña de La Gigante de la pintoresca ciudad de San Javier, la segunda misión que se construirá en Baja. Podrá llegar a la costa del Pacífico en 1. 5 horas y estar en la bahía de Magdalena con las ballenas a medida que crían a sus crías para hacer el viaje al norte.